The 50 hours contest is a contest that runs for 50 hours (2 days plus 2 hours). It gives a prize to the 3 best ranking players, the first prize of course the highest and the 3rd the lowest. You can see the prize amounts on the contest itself. All game machines of a certain game (e.g. No Devil or Spin2Pot) are connected to the contest. 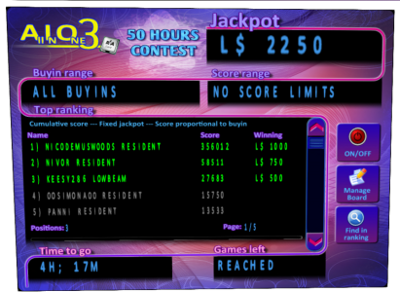 It’s a cumulative contest, so it totals all your scores during the 50 hours and that is your score on the contest. The contest is relative, your scores are divided by 10,000 and then multiplied by the amount you played. So if you play a L$500 game, your score counts 10 times heavier as a L$50 game. (Thus if you play L$500 by playing 10 times a L$50 game, it is the same as one L$500 game). The contest pays automatically when the time period finishes. You don’t have to do anything. At the 50 hours contests, the value of M = 10,000.